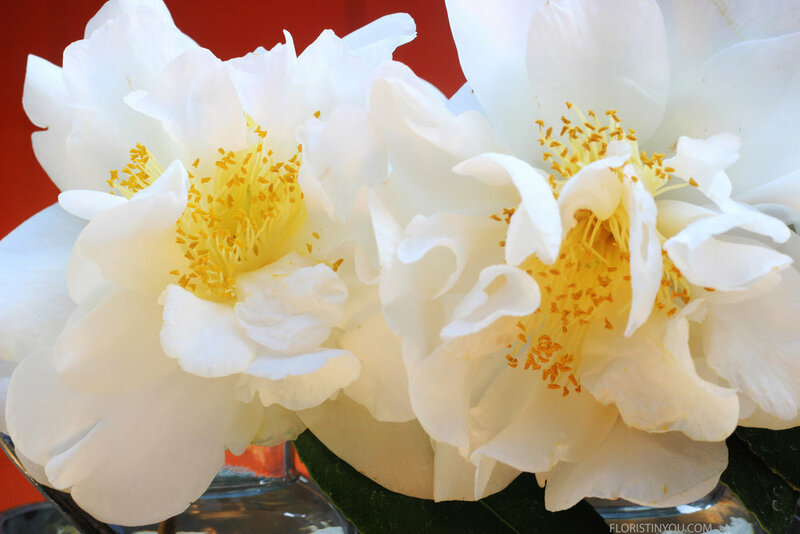 3 Camellia blooms with stems cut long or 6 to make it double sided. My friend gave me this beautiful little caddy that holds 3 bottles and is perfect for camellias. It has been cold lately in Southern California, but guess what? The camellias are blooming and they are just the right size for it. Look at these beauties. They have golden silk like stamens and lots of ruffles. And this arrangement couldn’t be any easier! Just cut the blooms and set them in the bottles that have a little floral food mixed in the water. Voila…you’re done. That’s it. I told you…it’s as easy as 1,2,3. So, grab your gardening shears and let’s go. Cut 3 blooms or 6 for double sided. Cut stems long. Add a little floral food to water and pour into each bottle. Cut stem on a 45 and add to water in 1st bottle. Cut 2nd stem on 45 and place in water in next bottle. Cut third stem on 45 and place in water in last bottle. The caddy is polished with a circular pattern that adds interest.